Even more going on at Bramham… Despite its disrupted schedule, next week, eventing will become the first equestrian discipline to announce its team for London 2012. With the remaining slot said to be between five riders, Bramham is even more exciting this year. Click here to read the full story by The Telegraph. Arguably the biggest technological impact for horse riders has been the body protectors that inflate, and jumps that collapse thanks to “frangible pins”. Zara Phillips says technology “has changed so many sports, but it’s saving lives for horse riders”. Zara Phillips kept her hopes of Olympic qualification alive with a winning start to the eventing season in Hampshire. It is expected that William Fox-Pitt, Mary King, Piggy French and Nicola Wilson are all likely to represent Britian this year at the Olympics, leaving only one place open. Zara Phillips and double Olympic bronze medalist Tina Cook and both fighting for the spot. When London last hosted the Olympic Games in 1948 the 10th Duke of Beaufort was President of the Institute of the Horse and Pony Club which was charged with organising the Equestrian competitions on behalf of the FEI. The Three Day Event, with the Cross Country held behind the RMA Sandhurst on Barossa common, was deemed a medal opportunity for the home team, steeped in hunting and racing history. Sadly it didn’t work out that way during the week of 9th-14th of August. Only two British riders finished: Major Borwick and Liberty in 17th place and Brigadier Bolton on Sylveste,27th. The Duke decided that he would offer his park at Badminton to run an event of Olympic specifications in order to give British riders match practice. Billed as ‘ The most Important Horse Event in Great Britain.’ , the first Badminton Horse Trials ran in April 1949. With the Olympics returning to London, and Equestrian sports no longer out on a limb at some distant venue, but at the centre of things in Greenwich Park, Badminton Horse Trials will be supporting Equestrian Team GBR’s fund raising efforts for the British intetrnational teams of today and the future . The Trials, which run from 3rd-7th May now hosts riders from all over the world, who will be using it as a final attempt to impress their selectors and Team GBR will have a major presence on site London 1948 spawned Badminton. Badminton 2012 is returning the compliment. 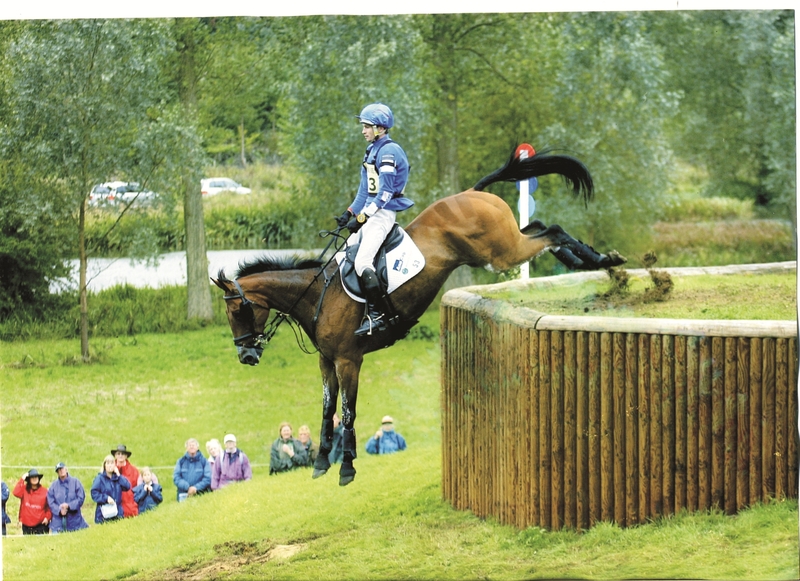 Our sponsored riders Paul Tapner, Francis Whittington and Kitty King will all be at The Badminton Horse Trials. Do you which of our sponsored riders mentioned above features in this picture?